Residence time distribution, software for tracer experiment interpretation and flow simulation. For Residence Time Distribution calculation and tracer experiment interpretation. A software tool for teaching and industrial use. 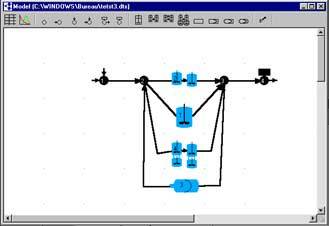 The "DTS" software package facilitates the simulation of flow models with the Residence Time Distribution method. In particular, it simplifies interpretation of tracer experiments in reactors in other industrial and laboratory systems. Using a tool box, the user can directly build a flow model by connecting different elementary modules (mixing-cell, perfect mixing-cells in series, plug-flow reactor, mixing-cell in series with exchange, plug flow reactor open to the diffusion, plug flow reactor closed to the diffusion,...). The software automatically gives the theoretical response to any tracer injection (impulsion, step, or any other signal) without writing any mass balance equations. In order to fit the model to tracer experiments, the software can easily optimize one or several parameters. The "DTS" software package runs under WINDOWS systems.